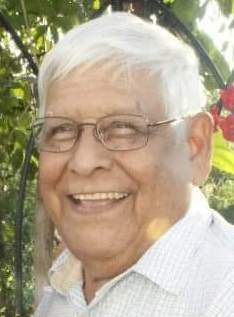 LEIPSIC – Pedro G. Chavez, 85, of Leipsic died 2:54 p.m. Thursday, September 6, 2018 at St. Rita’s Medical Center, Lima. He was born January 30, 1933 in Burgos Tamps, Mexico to the late Albino Barrera and Elodia (Gutierrez) Chavez. On September 28, 1954, he married Josefina Castillo and she survives in Leipsic. Other survivors include four children: Mrythala (Emiliano) Calderon of Waco TX, Rosaura (Esmael) Hernandez of Leipsic, Pedro Chavez, Jr. of Alto, GA and Perla Chavez of Pandora; six grandchildren,Belyna (Rolando) Rodriguez, Adrian Chavez, Priscilla Baney, Katrina (Juan) Perez, Shannon Baney and Emilio Calderon; twenty-two great-grandchildren; two great-great grandchildren; and five siblings: Esperanza Castillo of Ottawa, Consuelo Ledezma, Gregoria Scogin and Maria Chavez all of La Feria, TX and Santos I. Chavez, Sr. of Gilboa. He was also preceded in death by a son, Leroy Chavez; a grandson, Bernardo Rincon; a great-great granddaughter, Maya Marie Schroeder; and a brother, Alberto Chavez. Pedro retired as a welder for Nelson Manufacturing in Ottawa. He was a member of St. Mary’s Catholic Church where he was a Eucharistic Minister and past president of the Guadalupe Society. Pedro was well respected by many and he was lovingly known as "Papa" to not only his grandchildren but also to many others in the community. Papa was always joking around and his smile had a way of welcoming everyone and making them feel at home. He loved rocking the babies in the family and soothing them with his "RuRu" lullabies. Wherever Papa was, Mapina (his wife), was not far behind because he adored his "Momma" and never wanted to leave her side. He enjoyed gardening and cooking with his Momma and cherished spending time with family and friends. Papa will be greatly missed. He was special to each and everyone of us. A Mass of Christian burial will begin 10:30 a.m., Tuesday, September 11, 2018 at St. Mary’s Catholic Church, Leipsic with Fr. William Pifher officiating. Burial will follow in the church cemetery. Visitation will be Sunday from 2-4 and 6-8 p.m. at LOVE HEITMEYER FUNERAL HOME, Leipsic where a rosary will be said at 7:00 p.m. Additional visitation will be one hour prior to the funeral mass on Tuesday at the Parish Life Center. Memorial donations may be made to the family for the headstone.